Hi there everyone: Well, I don't know about you but, I like to have a good stash of Holiday cards ready for when the Season arrives, I've been making a good amount of Christmas cards but I don't have many for Halloween and Thanksgiving so, here is my first Halloween card of the year. 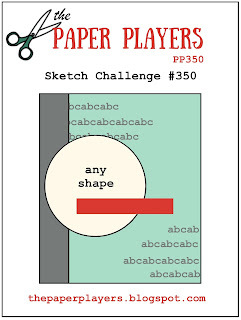 I'm linking it to a few challenges at the end of this post. 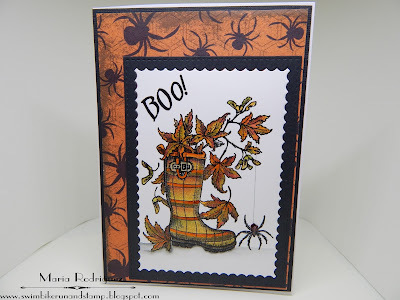 This is a really beautiful image from a Power Poppy set called Feeling Fall and, even though I think the intention of this image is for a Fall card, I made it Halloween by adding the scary spider from the retired Stampin' Up! set called "Dark and Dreary". 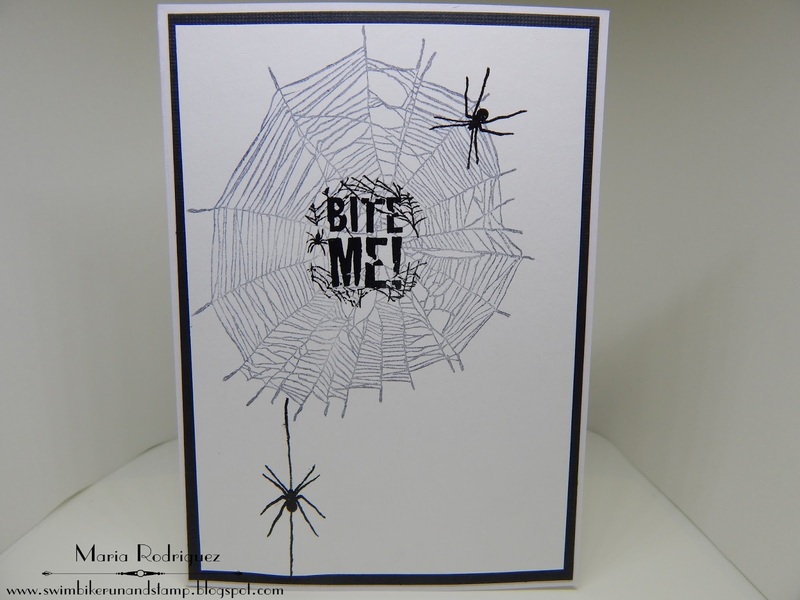 I often combine stamp sets, old and new, to create the scene I want, in this case, that spider did the trick. 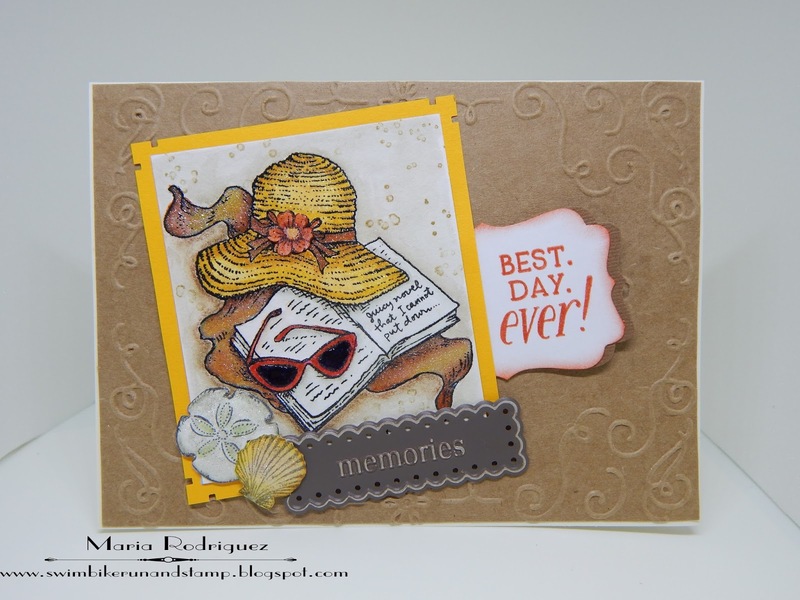 The images are stamped onto a die cut panel of water color paper with Versafine black ink and clear heat embossed, then colored with some of my Sakura Koi water colors. 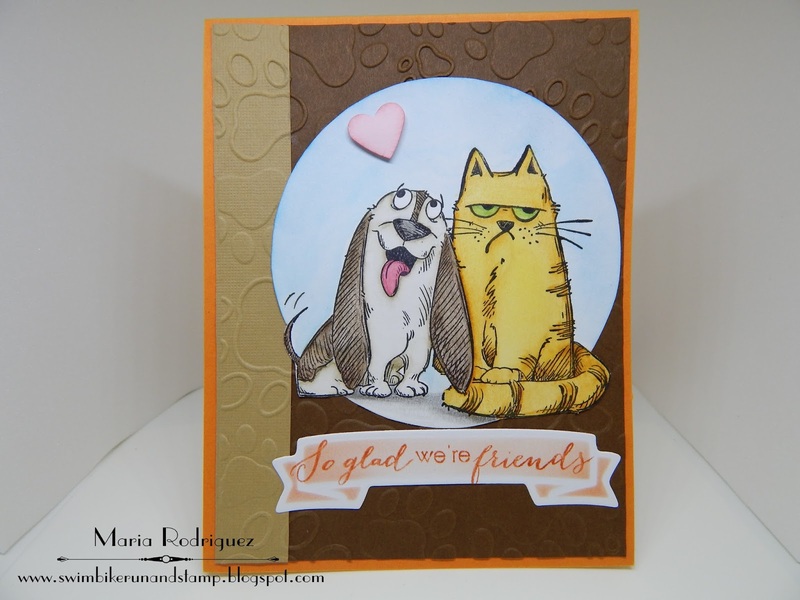 The sentiment is from the set and the pattern paper from my stash. 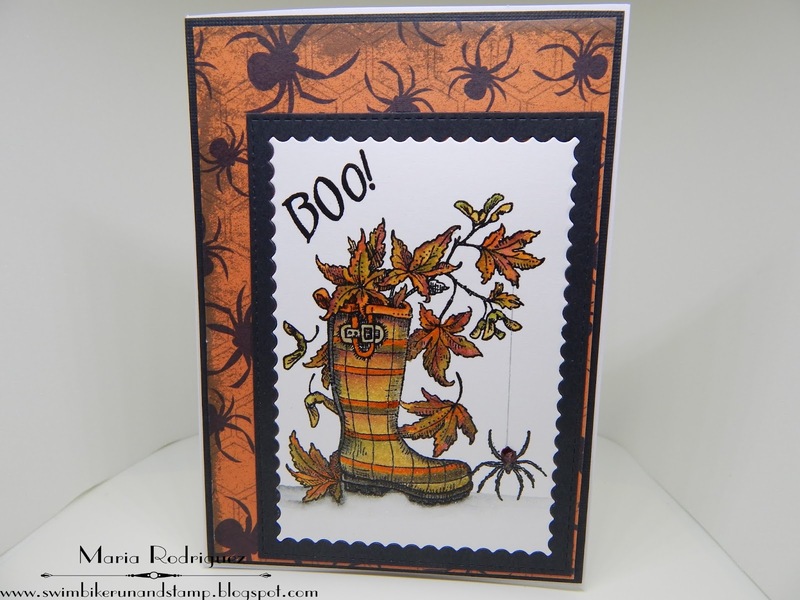 This images are from a retired Stampin' Up! set called "Bite Me! ", love it!!! 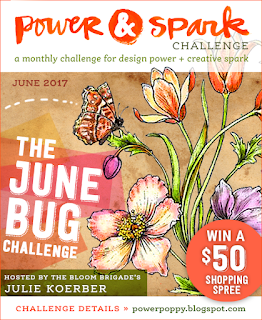 Power Poppy June Challenge Add a bug. 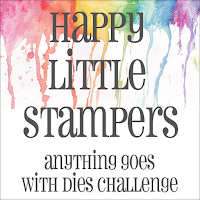 heARTful Stamping Challenge "Anything Goes+a Stamp"
2 Crafty Critter Crazies Challenge #3 "Anything Goes with a Critter"
Hello everyone: Well, kids around the USA are on Summer Break, I love it!!! because I get to see my grandkids very often, they come our house to go to the club house pool, they go on bike rides, spend the night, etc. Even if they are not little anymore, (19, 17, 14, 13 and 9), they still love hanging out with Grammy and Grandpy and Grammy and Grandpy couldn't be happier. We, hubby and I, have been so fortunate to have this children in our lives from the moment they were born to right now, we were able to take them on Spring Break vacations since the oldest ones were toddlers, for 15 consecutive years, we went all over the USA and Mexico with them, our best memories of this vacations were to the beaches of Mexico and Panama City FL. The SHOPPING OUR STASH challenge is a super fun one, it's all about what you like to do when you are on vacation, for me.....give me a beach, surf, sand and a cold beer, let me watch my grandchildren splash around and build sand castles, that's the ticket. Here is my inspiration card for you, if you want more inspiration, hop over the challenge and see what my awesome teammates created, you will be happy you did. 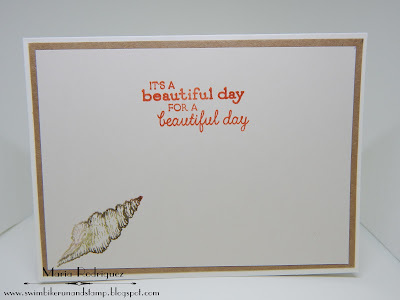 This image is from my older stash of Power Poppy stamp sets, it's called Best Day Ever, the little shells are from an old Flourishes set called "Seaside Life" I just stamped them with gray Stazon ink, colored them, fussy cut them and adhered them to the panel with glue dots, the word "memories" is from my stash of metal sentiments, it's just perfect for my card. 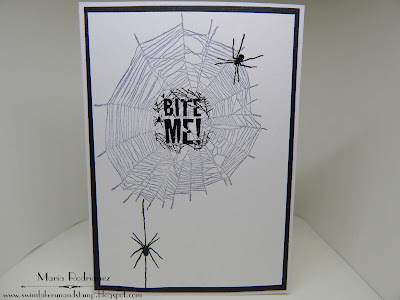 I stamped this images onto water color paper with Stazon black ink and colored with my Stampin Up! markers and my FIXED WINK OF STELLA brush. The sentiment is from the same set. 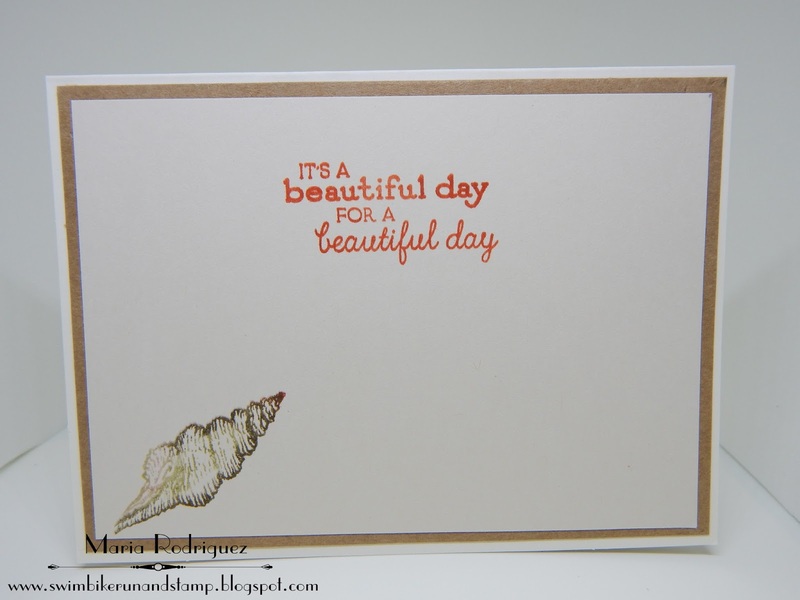 The sentiment and shell are also from the sets. So come on over to the SHOPPING OUR STASH challenge blog and join us, I'm sure you have tons of memories of past vacations, whether on a beach, the mountains, interesting cities, camping, cruising, etc., you could share them with us in the gallery. Don't forget to hop over my teammates blogs to see their beautiful creations, I'm sure you will be super inspired.